Always ready for the scramble call, this is a recruit experienced in piloting assault subs who is also invaluable in crew battles. He’s currently known to be piloting a custom Moray as part of a small bail enforcement outfit, and the stoic face of a wolf has glared out from the depths at many a wanted criminal. 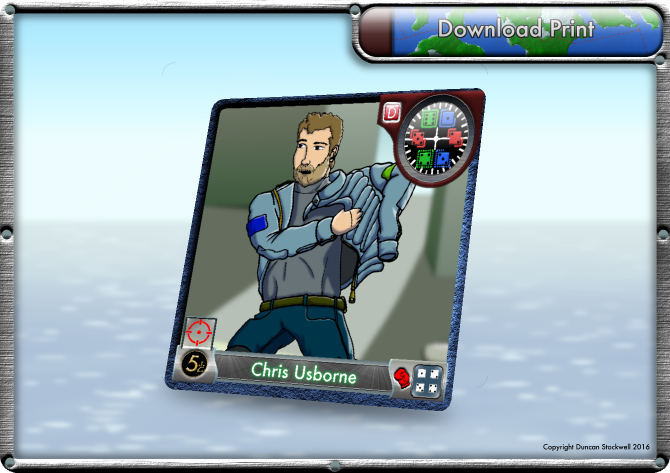 Whilst Chris can be devastating with very strong subs – and his skill as a sharp-shooter could also help to bust open even the hardiest of targets – it may also be an idea to deploy him in faster crafts to balance his SymRoll scores. The artwork for this card was done with a pencil and paper sketch of the character, then inked over with Copic fine-liners. After scanning it into GIMP I used my Wacom Intuos to refine the lines, colour and shade. The background is a section of a SketchUp model of Freeholt City I’ve made up.